Everyone is invited - individuals and families, members and guests - to celebrate the summer at the yearly picnic of the Seattle-Gdynia Sister City Assn. Come to learn about upcoming SGSCA activities, to chat with City of Gdynia representatives Bartosz Bartoszewicz & Maja Wagner as well as exchnge students and to socialize with other Polish-Americans while munching on roasted kielbasa and other delights and enjoying a day in a park. Walk in the Seafirst Torchlight Parade with the Seattle-Gdynia Sister City Association! SGSCA secured a place in the parade and invites all folks from the Polish community to join in the fun! You'll be marching along a vintage T-Bird automobile. Over 100 units march, dance and float in the parade; this is your opportunity to make a Polish accent at the event! The Seattle-Gdynia Sister City Association turns 25! Celebrate the anniversary along with your SGSCA friends and a delegation from City of Gdynia at a dinner held at Salty's restaurant. Special guests include descendants of Chief Seattle, Ken Workman and Mary Lou Slaughter. SGSCA's achievements include producing Seattle Polish Film Festival and organizing exchanges between the cities, including a summer business school for HS students co-organized with Washington Business Week. Congratulations! The Shaking the Tree Theatre in Portland presents a shadow puppet show LUMINARIES. In the Shadow of the Polish Avant Garde. This immersive theatre performance was inspired by the Polish Avant Garde art movement of 1918-1939. It uses images and ideas of the artists of the period, including by Maria Jarema, Katarzyna Kobro and Wadyslaw Strzeminski. Staged by collaboration of Teatr Figur in Cracow, Poland and artists from Portland, directed by Dagmara Zabska. Where: at Shaking the Tree Theatre in Portland, OR; six performances over three days - see the ticket info for details. The 7th annual Polish Festival Seattle is part of the big ethnic festival series at the Seattle Center, known as Festal. The venue is again the Armory and the Mural Amphitheatre. 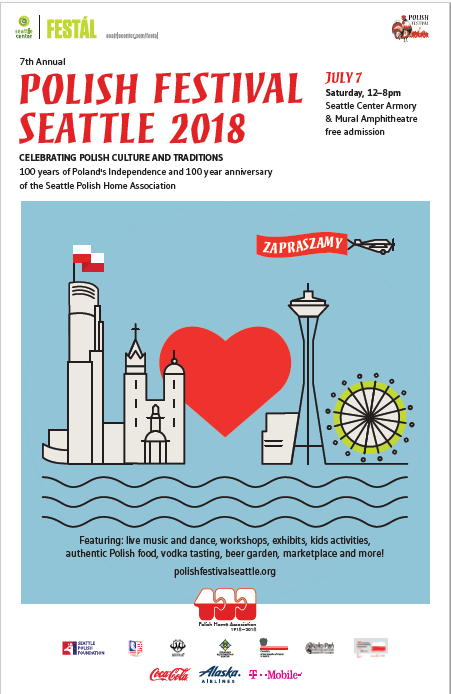 The Festival focus this year is on the 100th anniversary of regaining independence by Poland as well as the centennial of the Polish Home Association of Seattle. Attractions include: live performances by folk groups and music bands, a Chopin piano concert, a movie about Polish community in Seattle, exhibits: about 1918 Poland and the independence fighters; cooking demos and workshops, children’s activities and more. Vodka tasting is coming back! Vendor booths offer Polish glass art, hand-crafted pottery, crystal, jewelry, and paper cut-cut art. Also available: plenty of great Polish food and a beer garden. The Festival needs a lot of volunteers for late afternoon and evening shifts, specifically for food court, baked goodies and children activities. A free festival T-shirt and food tickets for 3+ hours of volunteering! The Polish Cultural Center is open on Friday nights in July but it is closed on Sundays. It will be closed for the yearly summer break in August.